Ruby is one of the four precious stones - the other three being diamond, sapphire and emerald. 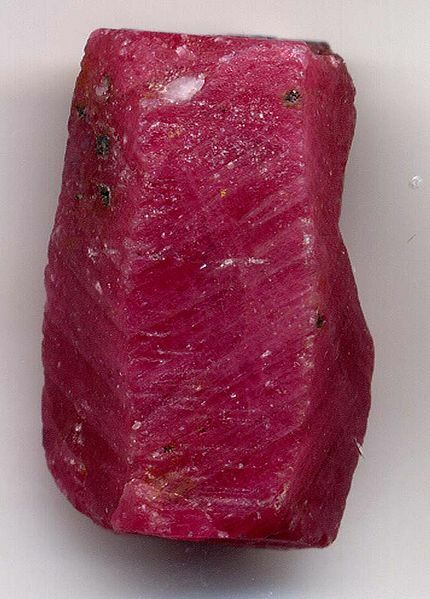 The price of a ruby is affected very greatly by its color. The brightest red rubies, called "pigeon blood red", are much more valuable than other rubies of a similar size, cut and clarity  - and top quality pigeon-blood rubies can be among the world's most expensive gemstones, fetching several thousand dollars per carat. The following is an account of the ruby from Charles William King's 1866 book "Antique gems: their origin, uses, and value". "The name of this stone is merely an epithet of its colour, as being the red variety of the Hyacinthus. For the same reason Marbodus calls the same gem "Granaticus", from its resemblance to the vermilion blossom of the pomegranate. This was probably the anthrax ("live coal") of Theophrastus, of which he says that a very small stone used to sell for forty gold staters (about forty guineas), a statement which could not apply, at that period of high civilisation and extensive commerce with all regions, to the Garnet or Carbuncle, a common stone and produced abundantly in many parts of Europe. It must also be included among the numerous species of the Carbunculus described by Pliny, although he gives the first rank to the Carbunculi Amethystizontes, our Almandines or Garnets of Siriam. One of the qualities which he assigns to the Carbunculus, that of not being affected by the fire, whence they were called Acausti, only applies to the Ruby, for the Garnet easily fuses into a dark globule of oxide of iron. Henckel relates an experiment in which a Ruby was sufficiently softened by means of a powerful burning-glass to receive the impression from a Jasper intaglio without the slightest detriment to its original colour and hardness when it became cold. "It is almost certain that this gem was the ancient Lychnis already mentioned under "Jacinth." All that Pliny says of it is, "Of the same family of blazing stones is the Lychnis, so called from its lighting up lamps [or, perhaps, lighting up by lamplight, lucernarum accensu], but yet of extraordinary beauty. It is produced near Orthosia and in the whole of Caria and the neighbouring regions; but the most esteemed in India, which sort some have called a Carbuncle of milder hue. The second in rank is the Ionia, so called from its similarity to the flower of the same name (the Greek Ion, or red cyclamen). And amongst these sorts I find there is a difference; one kind has a purple lustre, the other a red (cocco): warmed in the sun or by friction with the fingers, they attract straws and scraps of paper." The description of it given by Solinus is, as before, more definite; he calls the stone Lychnites, because it shines most by lamplight: it is both of a transparent purple and of a light red, and attracts bits of thread, straws, &c., when rubbed or heated in the sun. It is very difficult to engrave, and then pulls away the wax as if by a bite - " velut quodam animalis morsu." 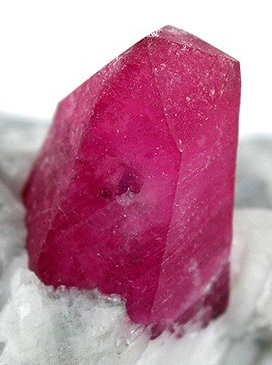 "Now all these qualities can be found united in no other gem than the Ruby: the best still come from India (though inferior ones are sometimes found in Bohemia). The finest Ruby shines with the red of the cochineal (cocco), the Balais is often quite of a lilac colour (purpura): they are only surpassed in hardness by the Sapphire and the Diamond; in fact, none but Oriental artists ever attempt engraving on them in modern times. I have not yet had an opportunity of trying whether the scarlet Ruby is electric; but, from its belonging to the same class as the Sapphire, it probably will be found to possess that property. In my own collection is an antique intaglio, a head of M. Aurelius, cut on a gem exactly answering to this description of the Lychnis: its colour is a curious mixture, a yellowish red, appearing purple or lilac when held against the light, and at a certain angle presenting shades of blood-red: the stone itself is as electric as amber, and apparently of excessive hardness. 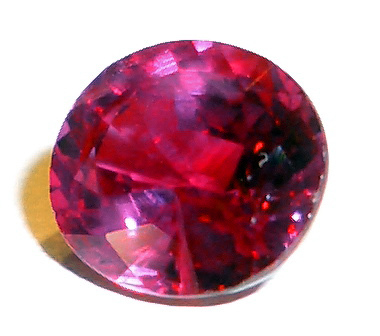 It was pronounced by a very experienced lapidary to be a Spinelle Ruby, but more probably it should be termed a Balais. "The Romans experienced the same difficulty as exists at the present day in distinguishing the various sorts of the Carbunculus from each other, in consequence of the practice of jewellers of backing them with various foils so as to improve their colour, "tanta est in illis occasio artis, subditis per quae translucere cogantur." 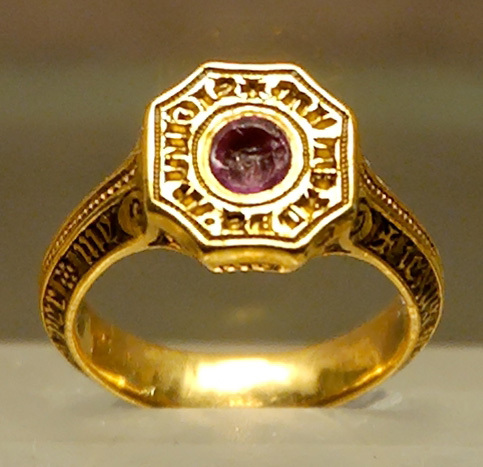 This delusion is especially to be observed in works of the Renaissance, where camei portraits, set in rings, often appear like the finest Rubies, but are in fact only Garnets backed with a ruby foil. It was also believed, in Pliny's time, that the dullcoloured Carbunculi could be made lustrous by maceration in vinegar for the space of fourteen days, and that the effect lasted for the same number of months. These gems were also imitated so well in paste, that the false ones could only be distinguished by their inferior hardness. And this is exactly true, for I have met with an antique paste bearing a splendid intaglio of a Medusa's head, which could with difficulty be known not to be a real Carbuncle; it even showed all the flaws within its substance, which the real stone always presents. 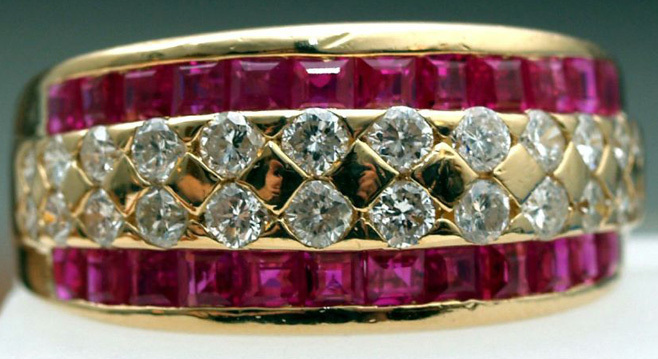 "True Rubies, and of good colour, uncut, but rudely polished, occur both in ancient jewellery and set in antique rings. In the Herz Collection was a necklace formed of rough Rubies and Emeralds of fine colour of the size of horsebeans, drilled through and linked together with strong twisted gold-wire, in a similar manner (but much more substantially) to the Sapphire necklace from Richborough, already described. The Ruby, though of the same chemical composition as the Sapphire, yields to it in hardness; but yet antique intagli are even rarer in it than in the former stone. In fact, the experienced Lessing, as well as the Comte de Clarac, altogether deny the existence of any really antique intagli in these harder gems, but the instances already adduced under "Emerald" and " Sapphire " sufficiently prove that this dictum, though generally true, yet admits of some rare exceptions. It may also be remarked in this place that engravings on any of the precious stones are always to be examined with the greatest suspicion, modern artists engraving for wealthy patrons having found it their interest to employ such substances as recommended themselves to their purse-proud employers by the mere value of the stone (a thing which at least they could appreciate), as well as by the art thereupon displayed, which was frequently to them but a minor consideration. The ancient artists, on the contrary, chose such stones as were best suited for the execution of the work, and to give the most perfect impression of it when required for use as a signet; always, for these reasons, preferring the Sard, on which more engravings by the famous artists of antiquity are to be found than upon all the other gems put together. Entirely devoted to the one object, that of attaining to perfection, they entirely disregarded the paltry merit of overcoming obstacles by the fruitless waste of their invaluable time; neither did they seek for glory by the preciousness of the material of their work rather than by the excellence of the work itself. "The following are the only intagli on Ruby that I have met with of apparently indisputable authenticity:—A head of Hercules, in the Webb Cabinet, of good bold work, the stone of small size, and bad colour, and full of flaws. A magnificent head of Thetis, wearing a helmet formed of a crab's shell, of the finest Greek work as far as the style can guide one's judgment, engraved on a large irregular stone of a beautiful rose-colour: it belonged to the Herz Collection, where, however, it was classed among the Cinque-Cento gems. On a pale Ruby, too, occurred the very finest intaglio I have ever beheld, a full face of a Bacchante crowned with ivy; the expression of the countenance full of a wild inspiration, and the exquisite treatment of the hair and the flesh beyond all praise,—a true masterpiece of the best days of the Greek glyptic school. At the side was the name Eaahn in very minute and elegant characters, a name which was previously known as occurring upon an admirable bust of Harpocrates. This gem was pronounced antique by the best judges in Paris, and is now in the Fould Collection."